The VELUX Group, the largest producer of roof windows in the world, headquartered in Denmark, has signed up as an official sponsor of the Men’s EHF EURO taking place in Poland from 15 to 31 January 2016. 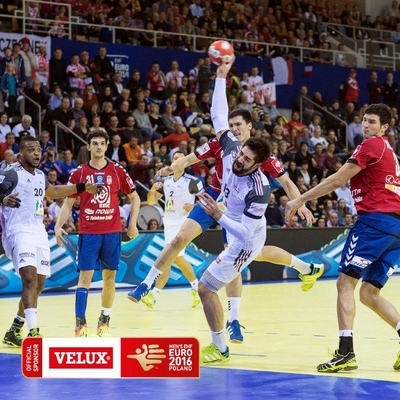 The company, already well-known throughout handball as the title sponsor of the VELUX EHF Champions League, is now expanding its involvement to the national team flagship event. The official sponsorship agreement has been closed by Infront Sports & Media, exclusive media and marketing partner of the European Handball Federation for the EHF EURO events. The VELUX Group will benefit from two prominent floor advertising positions as well as an extensive LED advertising presence at the EHF EURO and possibilities to activate the sponsorship towards customers and partners. Jean Brihault, EHF President, said: “The VELUX brand has already developed a strong presence on the handball market through its successful long-term title sponsorship of the VELUX EHF Champions League. Michael Rasmussen, Senior VP Brand at the VELUX Group, commented: “With the EHF EURO 2016, we can extend our handball commitment in multiple key markets for the VELUX Group and share the passion and professionalism that best describes the VELUX Group. Stephan Herth, Executive Director Summer Sports at Infront, said: “The EHF EURO platform enables the VELUX Group to exploit its sponsorship with an ideal mix of regional activation in local and international media exposure across Europe and beyond. Besides the VELUX Group, the Official Sponsor line-up will feature a maximum of eight brands, including BAUHAUS (workshop, house and garden specialist), AJ (mail order office furniture, materials handling and storage solutions) and Intersport (sporting goods retailer) – already confirmed.